In Taking Power Back: Putting People in Charge of Politics, Simon Parker argues for urgent reform of the UK’s centralised democracy. Tony Travers welcomes this book as a well-researched account that both outlines the historical decline of local government in the UK and proposes innovations through which citizens can gain more direct control over their own lives. However, public faith in the capacity to actually secure such empowering change remains a pressing question. Taking Power Back: Putting People in Charge of Politics. Simon Parker. Policy Press. 2015. Most prescriptions for reducing the centralised nature of the British State jump quickly to proposals to give greater powers to sub-national units of government. 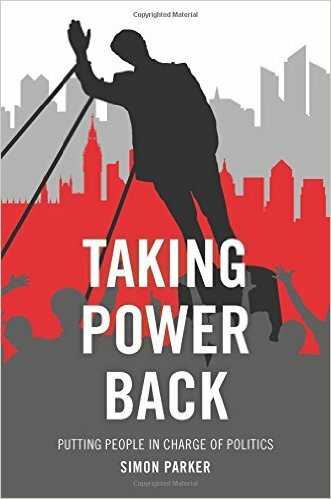 Simon Parker’s new book, Taking Power Back: Putting People in Charge of Politics, mixes support for such traditional solutions with parallel proposals to embrace a variety of innovations intended to give citizens the capacity to take more control themselves. There is no question something needs to be done. The degree of centralisation within the UK, and separately in England, Scotland, Wales and Northern Ireland, is a national embarrassment. Virtually all taxation is set in Whitehall. Most policy is determined by people based in SW1, or from a similar governmental core in Edinburgh or Cardiff. The implication of running a country in this way is that there is thought to be a deficit of competent politicians and officials outside capital cities. If true, this would say something ominous about the condition of democracy in the UK. But it is not true. Central government is not all-wise and consistently competent. Parker cites Anthony King and Ivor Crewe’s The Blunders of Our Governments (2013) as clear evidence of the incompetence and failure of much top-down government. He could also have listed dozens of National Audit Office reports on poor value for money relating to IT systems, defence procurement and failed policy innovations. Taking Power Back outlines the historical decline of British local government and the problematic ascendancy of the ‘postcode lottery’ issue. The origins of this fundamentalist social-democratic mantra are traced. Parker also points to the paradox that despite a national obsession with the avoidance of a postcode lottery, the National Health Service has never eradicated differences in provision and/or outcomes from place to place. No one will be in any doubt that the GLC is now a campaigning organ and a bastion of power for the Labour movement. Part of our task is to sustain a holding operation until such time as the government can be brought down and be replaced by a left-wing Labour government. The importance of such opinions, expressed almost 35 years ago, is reinforced by the fact that contemporary Corbynistas, including Livingstone, would argue something similar about the Labour leadership today. But as the author notes, the failure of the municipal left led not to a left-wing Labour government but to Blairism and managerialism. The problem of having reached ‘peak state’ is also considered. Parker accepts it will not be possible to increase the size of the State to meet an ever-growing demand for healthcare and social services. This realisation that taxpayers seem unlikely to increase their willingness to fund people’s (i.e. their own) infinite demand for public provision is another starting point for the search for a new solution. The book’s proposals are set against the backdrop not only of centralisation, but also of the impossibility of keeping pace with voters’ expectations about public services. The key challenge for Parker is to analyse alternative systems and innovations that might provide clues as to how Britain might change. The author accepts that a move towards left-of-centre self-help (one of the proposed ways forward) would not be particularly new. Robert Owen, William Morris and, more recently, William Beveridge and Michael Young are quoted as providing historical examples of how the centre-left can come up with proposals for a more cooperative (as opposed to consumerist and/or statist) political economy. A number of the better international examples of contemporary civic innovation are examined. Mayors using mime artists to discourage bad driving or governors creating investment funds make perfect sense and are suggestive of a more freewheeling attitude to innovation among sub-national leaders in other countries. But it is what the author calls ‘commonism’ that is put forward as the possible solution to over-centralisation and the impossibility of continuously expanding the all-powerful State. A basic national income is part of the change needed, as is a reduction in the (central) State’s role in social policy. Parker points to the paradox that there ‘is something oxymoronic about the idea of a national programme or constitutional programme for giving power away, especially as we need to engage the public much more fully in the discussion’. However, this is the central challenge to any reform proposals in a highly-centralised country: decentralisation has to be a centrally-driven policy. There is no other way, apart from revolution or anarchy. The central logic of the book’s proposals is to move to a position where city regions and other sub-national authorities use their (locally-raised) resources to promote local self-help and community action. Crowdsourcing ideas from the public and a number of other creative innovations are suggested. Some might be thought to sound a bit over-simple, but most are cheap and have been tried with success elsewhere. Lotteries to select representatives are envisaged to widen the pool of legislators, and/or to change the composition of the House of Lords. At its core, this book argues that Britain’s antique and centralised democracy needs urgent reform. Although there is greater support for devolution and decentralisation than for decades, many opposing forces will still have to be defeated. The obstructive nature of ministers and civil servants is discussed in the book, as is the fear of the postcode lottery. But there is also the challenge of the blocking tactics of elites at the centre who (wrongly) believe that sub-national government is in the hands of people who are incapable of running the kind of services now in the hands of State bureaucracies. Parker’s book should give heart to those who support a less centralised country, but also provide a challenge to the politically powerful at all levels. It is well-researched, and blends references to a wide range of historic texts with proposals for contemporary innovation. However, the public still needs to be convinced that change can empower them and give them greater control over their own lives. Voter anger and low turnout are real. Convincing the electorate to drive reform will be essential if the author’s decentralised, cooperative radicalism is to embed itself in Britain. Tony Travers is a Professor in the LSE Department of Government and Director of LSE London, a research centre at the London School of Economics.